Photos courtesy of Decorative Concrete Staining & Scoring Inc.
Ray Anger can thank his own extended family and a touch of career disappointment for launching him into the presidency of Decorative Concrete Staining & Scoring Inc., of Scottsdale, Ariz.
Not that entrepreneurship doesn't have its own challenges and concerns. 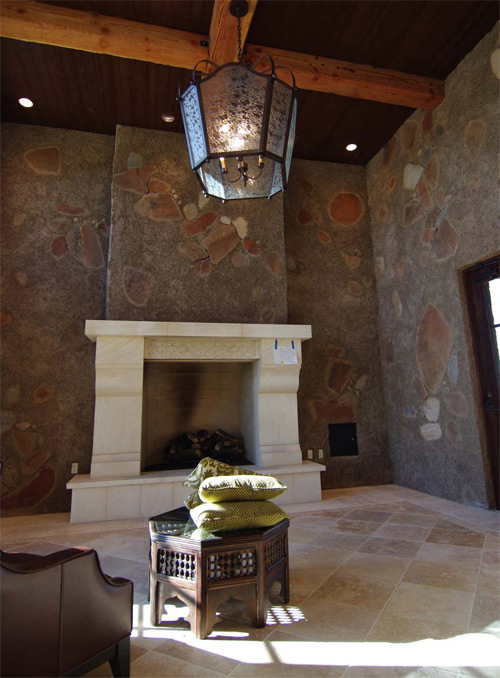 "The decorative concrete market in Arizona is terrible right now," he admits. Still, it's better than remaining a lead technician at computer processor developer Intel after the equipment under his supervision went robotic and he had little to do but dream of a career where he could actually accomplish something meaningful. Anger, 41, got a clue as to what that something might be every time he got together with those nearest and dearest to him. "My whole family's in concrete," he says. "I've got a brother in Texas who builds horizontal curb-cutting machines and another brother in Oklahoma who cuts concrete utilizing the machines my brother builds in Texas." Ditto for a sister and brother-in-law in Atlanta. "I was the only one in my family who went to college and did anything different." When he made the decision to change careers and go into decorative concrete, he did nothing halfway. "I sold my house and took the profits to invest in my business," he says. It was a business he knew basically nothing about, so he preceded the big jump by going on sabbatical from Intel in order to attend training classes. "At the time I was single," he adds, maybe unnecessarily. After all, what responsible spouse would put up with a home sale and an eyes-wide-shut leap into a new career? A whole new way of life, even? Anger hooked up with his Texas-based brother and got his first residential customers by working off of his sibling's many industry connections. Since he was only able to charge a starvation rate in the highly competitive Lone Star market, Anger moved back to Arizona after less than a year - but with a portfolio. You can go home again, especially when home is in suburban Phoenix in the midst of apparent prosperity. "It was 2002, 2003 - right in the middle of the housing boom. There was a lot of work in high-end residential housing." Anger was up against a lot of local competition. "Everyone was trying to get into the business. I'd be up against painting contractors who knew nothing about decorative concrete," he says. "Everyone was looking for the low bid, but low doesn't mean it's the right bid for the job. They weren't preparing the surfaces right, nor did they understand moisture mediation. "Surface preparation and proper moisture mediation are the foundation for all decorative concrete, especially here in Arizona where we lead the country in floor failures due to moisture problems. We'd get the call for repair work on jobs we'd been outbid on, after the surfaces delaminated." Well beyond merely fixing the mistakes of others, Anger has built a reputation in the Phoenix-Scottsdale area for getting it right. "Art - you can walk on" is how his Web site describes his accomplishments. In addition to custom stained concrete and other flat-surface work, he does countertops and custom-designed architectural features. He blasts garnet, a natural mineral abrasive, through 3M mats to stencil. When the housing market soured, Anger turned to commercial contracts. "To this day, we do a lot of work where we're following an existing theme," he says. 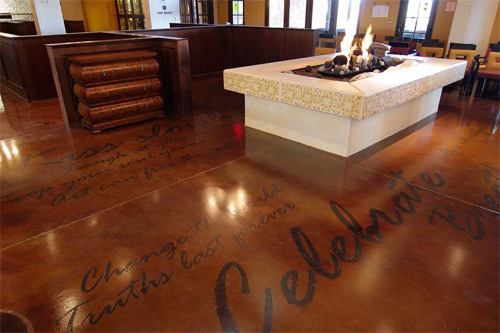 "We can blast a design into the concrete floors, on walls, on fireplaces, concrete countertops, wherever you want it. What people love the most about us is that, whatever it takes, we'll figure it out." Anger loves working with architects who have themes in mind but allow room for creative expression. For instance, Anger and his crew set sail for Margaritaville, first to Glendale, Ariz., and then to Uncasville, Conn. 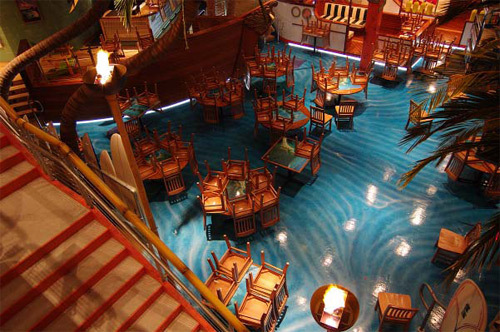 They worked with architects to help create new locations in those cities for fabled rocker Jimmy Buffett's chain of island-themed restaurants and bars. Anger and his crew got to blast, stain and etch intense blue floors with stingrays, ocean waves and other iconic island imagery. He was asked to take on similar projects for Jimmy Buffett's Margaritaville Cafes in Hawaii and Panama City, Fla., but had to turn down the work due to schedule conflicts and cost issues. He came back to a breezy nautical theme while working for Lakeside Bar & Grill in Peoria, Ariz. "It was another water theme," he says. "It was a sandbar that ran around the bar." Into it, Anger etched a sparkling blue river that ran the length of the bar and over the "sandy" floor. "What we've found," he says, "is that flooring sets the ambience for a place." When asked for the secret of his success, Anger says it's proper surface preparation. "We don't profile by shotblasting. It creates a cornrow effect. We open-blast because you can control the blast better, and we use garnet because you don't get a peening effect. Garnet is more of a controlled cut. Open blasting throws up a whole lot more dust, so you've got to guard against that, but it's worth it. The work lasts longer because you're giving the floor a better profile and your polymer stain grabs the surface easier. Then you start building art." Every job is custom, and rarely does Anger's company use stencils. For the ocean waves of the Margaritaville location in Arizona, his artist used a combination of freehand airbrush and roller techniques. 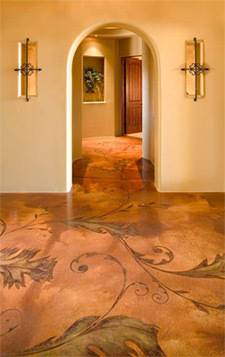 It was a different visual challenge altogether when Decorative Staining went to work at a Phoenix retirement community. The place is called Sagewood, and their logo is a sagewood tree. 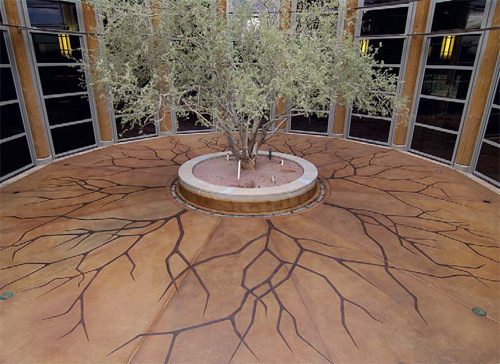 So Anger used an ecofriendly soy-based stain to replicate the tree's root system on a rotunda. Anger's portfolio is incredibly diverse, his projects ranging from churches and museums to restaurants, retailers and upscale homes. Deeply religious, the now-married father of three has accepted assignments from numerous churches of various denominations after first doing work for his own place of worship. "We just seem to connect with churches," he says. He tells of "a little old lady who stopped by my house and showed me a book." It was eight years ago, during his time of career disappointment. The book had a religious framework and prophetic title: "If You Want to Walk on Water, You've Got to Get Out of the Boat," by John Ortberg. "It was about risk-taking," he says. Anger's eye-opening, risk-taking moment took him beyond the semiconductor industry, but in one sense he didn't get as far from it as he might think. The work philosophy of Best Known Methods, or BKM, was pounded into him in an industry based on procedure and precision. "It's about developing a process and sticking with it," he explains. "You don't mess with the process." Ray Anger has created, adapted and stuck with his own process. From training to investing his home equity to starting his business in Texas and methodically expanding into commercial markets, Anger has developed a step-by-step procedure for achieving economic and creative freedom, career satisfaction and personal fulfillment.